This dainty 1887 Lodge is situated in private grounds (with off road parking) sandwiched between the historic English villages of Westerham and Brasted. Nearby lived Sir Winston Churchill (1874 - 1965 Chartwell) and King Henry VIII (1491-1547 Hever Castle). The Lodge backs onto Westerham Golf Club and enjoys picturesque Park Land designed by Capability Lancelot Brown (a renown Landscape Architect who designed gardens for Royalty). The Lodge is surrounded by open fields used for grazing milk producing cattle. The Lodge is located near to numerous tourist attractions such as historic English Heritage & National Trust Park land (some within just a few minutes drive from Brasted Lodge). This location enables easy access to London for which several trains run per hour using direct one stop journeys via Sevenoaks to London Bridge, Waterloo, Charing Cross - Trafalgar Square or Bromley South to Victoria. Both offer numerous fast rail one stop services to London, which are used daily by commuters. Additionally is Oxted Station with similar services. All are just a short distance from the Lodge. Further more Dover, Rye, Brighton, Hastings, Bournemouth are also just about an hours car ride away. Therefore you get the best of both worlds as the Lodge offers a country retreat or central London with its tourist attractions. The nearby M25 Motorway offers first class road access to Gatwick & Heathrow London Airports enabling quick travel to many South East locations. Completely renovated in 1995 to a very high specification, Brasted Lodge retains period features including an original fire place, high ceilings and moulded cornices. Modernisation offers up to date services whilst keeping the homely traditional feel. The Lodge is a Victorian Game Keepers facility situated near to the A25 with beautiful views over looking hills, farm and park land, known as The Garden of England. These were used to police Mansions (Valence) from poachers or trespassers. The Lodge has two double bedrooms and a third room which can either be used as a single bedroom or 2nd reception. Modern kitchen, including all appliances (integrated fridge/freezer, gas oven, gas hob, dishwasher, washing machine and BT Broadband high speed WiFi with two Smart TVs offering internet and catch up TV. Both Lounge and single bedroom have DVD players. Blue Pearl Granite Worktops with a breakfast bar for three. Both reception rooms have real flame fires (one wood or coal burning and the other gas operated). Natural beech wood floors are fitted to the hall and kitchen with fitted carpets to all bedrooms and reception rooms. Travertine is fitted to the en-suite bathroom with ceramic tiles to the Cloakroom and rear entrance lobby. WESTERHAM is on the boarder cross roads of KENT, SURREY, LONDON and is a lively, charming, historic village attracting Londoners who wish to get away from their LONDON business/homes to an idealic location that offers everything needed to make your stay memorable. The area has excellent road and rail transport links offering easy access to Central London and all the surrounding areas, numerous English Heritage and National Trust Historic tourist attractions, numerous restaurants (Chinese, Indian, Italian, French, English, Malaysian, Pizza to suggest just a few) and many bars/ pubs who also offer great food. All adjacent towns have a range of local leisure facilities (swimming pools, gyms, etc) and most are within minutes from the Lodge. Ease to transport makes the Lodge a great place to stay when travelling to LONDON (all time tables to be checked by guests). Car to Bromley South takes about 25 minutes, Sevenoaks 15 minutes and LONDON about 50 minutes (not advisable as the Capital has congestion zone travel charges plus high parking fees). Westerham GOLF COURSE immediately neighbours the Lodge and guests are welcome to attend their bar or restaurant even if it's just to take in the outstanding views and stay for coffee. The area is fantastic for walkers who love the countryside. Rabbits, badgers and deer frequently visit the surrounding parkland and gardens, making the views even more delightful. ACCESS from WEST using M25, is approximately 15 minutes to Lodge. Leave M25 @ Junction 6 and turn right (third exit) under M25 motorway. Travel south on A22 for one mile to next roundabout, at junction with A25. Turn left onto A25 and proceed through Oxted to Westerham. Continue on the A25 through Westerham village and the Lodge/Golf course entrance is approximately half a mile outside of Westerham going east in the direction of Brasted (Sevenoaks). This will be on the right hand side. Enter the grounds via Valence School/Westerham Golf Course access road, located on the right side of the A25 between two brick piers. Once in the grounds you will arrive at crossroads (located just before double gates which lead to the Golf Course). Here turn left back in the direction of the A25 & the Lodge will be seen on the right. Park in front of the gate so as to block the road, this being your spot, when staying. Don't worry only you have right of way to the road outside the Lodge. ACCESS from EAST using M25, Junction 5 is approximately 10 minutes to Lodge. Leave the M25 @ Junction 5 and travel south onto the A21. Soon after joining the A21 (about two miles) leave the A21 @ second exit slip road (signposted A25 to Westerham). Pass through Sundridge & after leaving Brasted village the Lodge will be seen on the left (a little out of Brasted). When inside the golf/school grounds follow directions above. The land surrounding Brasted Lodge has parkland, water and woodland gardens, first developed in the mid 1700 and later landscaped by Lancelot Brown in the late C18; further developments were undertaken by Edward Milner in the mid-C19 and by Henry Ernest Milner in the late C19, surrounding a late Victorian Mansion now known as Valence School which is a special need school for disabled children. This Mansion is located along way from the Lodge and consequently we never see staff or any children as all are transported by mini buses who use their own access route. The earliest references to the estate itself may be found in the Westerham church records of 1583. The Mansion with four Gate Keepers Lodges was built & owned by Norman Watney (owner of the very famous Watney Ale, very well known in the war years). Watney appointed Architect Frederick J. Robinson to rebuild a new Mansion (Valence School) and four Lodge houses, one of which is Brasted Lodge. This was done as Watney saw better opportunities for the mansion to be located high on the hill. The old Mansion was not ideally located (on the inner crossroads to Brasted Lodge, Westerham Golf Club and Fountains Cottages - now demolished & rebuilt as five detached homes). This offered Watney magnificent views of the North Downs. Although demolition of the original Mansion resulted, evidence of the Stable block with the Avenue of Lime trees (leading from the A25 to the original mansion) and Ice House, still remained to this day. Unfortunately fire destroyed the disused stable block so in 2011 this was redeveloped into Fountains Park. The Stable Block (known as Fountains Cottages and used by the Valence School Staff for living accommodation), was demolished after fire destroyed the L shaped building. This mainly came about as KCC vacated some eight or nine years previously, allowing the building to fall into diss-repair which gave opportunity for development in 2013 of Fountains Park, five detached dwellings on the original Mansions Stable footprint. This also allowed the Developer opportunity to plant low level laurels boundering the site. Valence School is a red-brick Tudor Elizabethan Revival style mansion, with two towers, stone and tile dressing, half timbered gables and a Cumberland slate roof. This and Brasted Lodge was built between 1885-87 by local Brasted builders, R. Durtnell & Sons Ltd. Valence School stands on a spur of high ground at c125 metres surrounded by areas of steeply-sloping parkland and woodland. By 1890, Dunsdale and Valence estates became the property of Watney brewery director, Norman Watney. Dunsdale mansion became tenanted and during the First World War it was used by the Red Cross as a hospital to nurse the war-wounded. In 1987, Valence Wood was severely depleted by the ravaging October storm. The opportunity was taken to fashion a golf course covering the area of Valence Wood, and the adjacent parkland to the north and north-east. This opened as a privately-owned golf club in 1997. ARRIVAL Please ensure we have your full details including mobile telephone number as this helps guide you to the Lodge and assist with arrival times, should your flight be delayed. Owner runs Architectural and Building Management Company, which is reflected in the interior design and attention to detail of the Lodge. Historic preservation is the owners speciality which too was used when refurbishing the Lodge. 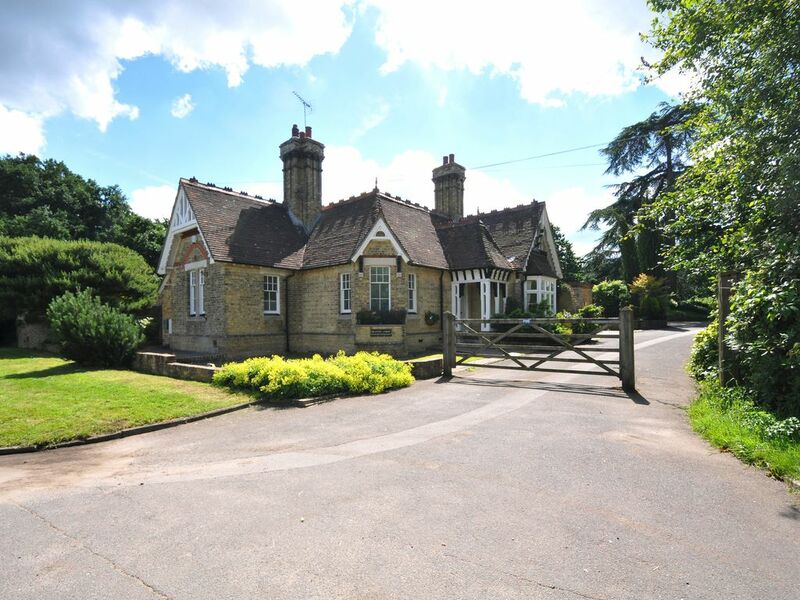 Built 1885 - 1887 as Gate keepers house to Valence Mansion for Norman Watney owner of Brewery, Brasted Lodge was fully refurbished in 1995 to incorporate all up to date mains services (gas, water power) whilst retaining and preserving all character of original Victorian charm. The surrounding grounds around the Lodge are known as Valence. This features 18th-century landscaped lakes, ponds and gardens designed by Lancelot Capability Brown. Watneys mansion at Valance is now a school for disabled children who attend by minibus. Isolation of the Lodge makes the house very private and tranquil and yet easy road access makes this an ideal location. Brief history of site The estate of Valence is listed in the first draft of the Domesday Book (1086). The site was first developed in the mid-18th century, with later landscaping by Lancelot Capability Brown in the late-18th century. Further developments were undertaken by Edward Milner in the mid-19th century and by Henry Ernest Milner in the late-19th century. Rob was a great host: he was very friendly on our arrival and ensured we knew where everything was (both in the house and around the local area) before he left us to it. The beds were extremely comfortable, all rooms were very clean, and the reception rooms were all great to spend time in for both work and relaxation. Our pleasure was meeting you and we are so pleased you both enjoyed and had a comfortable time at BRASTED LODGE. You were accommodating and helpful considering the boiler went faulty during your stay. May I thank you for all your help and understanding even though fixed within hours as I am sure this proved annoying. We loved our recent week at Brasted Lodge. We came from America and didn’t know what to expect and we were not disappointed in the least! The location was so perfect for our daily sightseeing trips. 1 hour to Brighton Beach, Hever Castle was just a short trip, Windsor was a little over an hour away and the train we took into London left from Oxted just right down the road. We were able to get a family pass for £30 for the four of us that included our train ride and all subway and bus rides in London as well. Our furthest drive was to Stonehenge and Avebury which took about 2 hours. The lodge had everything we could have needed and was well stocked with towels and linens. The bathrooms and kitchen were updated and very nice. The house stayed so warm when the temperature dropped at night. Our two boys loved the WiFi access and the tv and movie selections. We would love to return again and would definitely spend our time here at this wonderful gem. You are very welcome any time as we loved having you stay. As for the children, we would never had guessed these too stayed as you left the house immaculate. A big thank you from us. Please come again as there is so much to do just minutes from the Lodge like Hever Castle, Chartwell, Knole House/Park, Igtham Mote, Lullingstone Roman Villa, Quebec House, just to name a few. We’ve even had guests who have gone to Paris for the day on the EuroExpress from Ashford but I’ve not done this. This is what make BRASTED a fantastic location as we have great road motorway access and good LONDON train services, all be it a ten/15 minute car drive away. You can easily park in a Sevenoaks beside the station. From the US to England for a perfect stay !! We stayed at Brasted Lodge from October 10-16 and absolutely enjoyed every moment. Four adults had everything needed to make it feel like home. Robert was very helpful in suggestions for touring the area and was available for questions whenever needed. Would highly recommend anyone considering the area to definitely look at this property for a great stay/vacation. You are most welcome and it was a joy to meet you all. Maybe some day you may wish to return and if so you will be delighted to have you stay. Attractive and quirky cottage ideally situated for visiting sites in Kent and London. Comfortable beds. "Smart", well-furnished and equipped. Agreeable outside courtyard spaces for lounging, and plenty of off-road parking. Only downside is that although two of the three bedrooms had en-suites there was no bathroom for use by the occupant of 3rd bedroom, although there is a cloakroom. The cottage is floodlit at night. We really enjoyed our stay. The single bedroom offers duel use as many guests may not require five beds but prefer a third reception. This is why we also offer a mobile clothes hanging rail (within the four poster bedroom, so if required this can be placed in the single bedroom/3rd reception). We appreciate hotels offer bathrooms adjacent to bedrooms but this is after all a home & the two cannot compare. You will find many HomeAway properties are similar. Bedroom & bathroom location is documented within the website & known before booking and to criticise when already mentioned seams harsh when you knew before arrival what to expect. The Lodge is flood lit for security reasons, to aid night access as there is no street lighting. Without access would require a torch. The front is however switchable, so could be simply switched off (switch beside washing machine). The rear operates via a light sensor and cannot be switched off. This is deliberate as both aid security deterring opportunist thieves. Lighting is no different to street lighting when curtains and blinds are closed and bearing in mind this is my home causes not issues to us. Again this seams harsh as most live daily with street lighting especially in built up areas and we simply offer lighting to aid guests comfort. We noted you covered lights during your stay, which is far from a good thing as this may overheat lamps and may cause further issues. Lights offer safe guidance to entrance/vehicles, etc & we believe this out ways not having lights at all. It appears we are criticised if we don't or if we do, as what suits some may not suit others. We trust offers explanation & this did not affect your comfort and we look forward to your return someday. Beautiful property, clean, convenient and comfortable. Our family of 6 had a wonderful week at Brasted Lodge. Everything was communicated clearly before our arrival so we could show up and make ourselves immediately at home. The grounds are very private and it’s a gorgeous natural setting but also convenient to towns, trains, shopping, restaurants etc. The house was immaculate, comfortable beds, plush towels, sparkling bathrooms and kitchen and two delightful courtyards. My children greatly enjoyed watching the fish in the koi pond and the owner, Mr Mitchell, was kind enough to leave a bit of fish food so they could feed them. Mr. Mitchell responded quickly to all communications and went above and beyond to ensure our stay went smoothly. We forgot a few items upon our departure and he was immediately in touch to arrange for us to come by and pick them up. We chose this property on the strength of all the positive reviews and found that it lived up to them and then some. Thank you for a lovely week in the English countryside! many people have reviewed this house and have given it a 5-Star-Rating. Not us. From the outside look, it is a really lovely and beautiful house. It's setting is ok, in the middle between two villages and within easy reach of the A25. But... within easy reach also means the permanent noise from the A25. To avoid the noise in the front bedroom, the windowes are sealed. Also in the kitchen. In other words, neither in the bedroom, nor in the kitchen the windows can be opened. Especially in the bedroom, sleeping in very unconfortable with weather as nice as this year and no chance of airing or sleeping with a mild breeze. Also a smaller bedroom, which leads to the 2nd bathroom can not be aired, alas no airing there. And no cupbord to hang up your clothes. Only a sofa to stapel them on. The kitchen is equipped with exactly 6 items of knives, forks, plates and dinner plates. Either you wash your dishes after every meal or have the dishwasher running half empty every day. But be careful with that, we had the exact number of dishwascher tabs for our stay. So don't waste one! Or of cause, only take one meal a day. The glasses and cups are not matching and having wine for 5 people -for which the house is set- is impossible, only 4 unmatching glasses. Same with pint glasses by the way. The second bedroom with the en suite bathroom has a bed so small, it will test your marriage and there are only 4 places to sit in the living room. So after all, yes the house looks very nice and is well kept, although it was not ready on our arrival day. The deck by the Koi pond is a perfect spot to sit in the evenings. But all that only from the outside! The interior was very poor. It was just the essentually needed and not a single bit more. A proper tablecloth, not a wax one, matching glasses, enough plates to have breakfast and some scones in the afternoon, 5 wine glasses for 5 adults and also 5 beer glasses. This and windows, that can be opend would have made it a wonderful stay. But as it was, it was stuffy bedrooms, a lot of washing up and everyday tossing a coin, who was to drink what. Disappointing compared to all the houses, we hat rented before. It was all only small thinmgs, but those small things make the difference between average rating and 5-Star rating. This guest writes a damming review in an attempt to down grade because we needed to address guests failed HOUSE RULES. Guests disregarded SECURITY & SMOKING despite these being obvious to even a child. This necessitated emails in an attempt to ask guests to act responsibly. Each occasion we visited, we found openings unlocked & windows wide open breaching security. Cigarette buts were found scattered around grass & decking, something we specifically request be avoided. This showed no respect to protect/safeguard property & contents. As such we could not ignore nor recommend these guests to any Holiday Let Owners. Smoking was particularly relevant given the HEAT WAVE of SUMMER 2018 (the driest May-August on record) and yet despite, guests chain smoked on the highly flammable, tinder dry, wood decking & nearby sunbaked grass. Fire risk therefore increased, due to dry weather, as did theft by leaving openings wide open. Whilst we appreciate the heat wave was the reason for opening doors & windows, no one with any sense would leave windows open when vacated (photographic & video evidence taken to back what we state). 1) Traffic noise is a gross exaggeration in an attempt to degrade the property. Many guests comment on how quite the property is given its historic purpose to police poachers from gaining entry to the Lancelot Capability Brown Park Land. 2) Kitchen/Front Bedroom windows are triple glazed to increase security and minimise heat loss whilst also improving noise attenuation. What is not mentioned is the Kitchen has a spilt stable door which offers more fresh air ventilation than any one could desire. Ditto the Wet Room has openable windows. The house being Victorian with thick solid walls meaning it stays cool in summer and retains heat in winter. 3) Comments on plates/cutlery/glass quantity is inaccurate as there are plenty for five. We cater for six (five being the guests requirement). 4) Washing up is a norm and we fail to appreciate why this would upset. 5) We provide Washing Up liquid, Dish Cloths, Scourer Pad, Soap, i.e.above the norm for self catering accommodation. So to criticise when offered is unreasonable. One Dishwasher Tablet a day is simply just complaining for the sake of things to mention. Westerham; located below the North Downs, 6 miles west of Sevenoaks, 5 miles South of Bromley, 4 miles West of Oxted. Westerham is situated in Kent (a mile from both London Borough of Bromley and Surrey borders) south of the A25 between junctions 5 and 6 of the M25. Central London is 15 minutes by train via Bromley South, 29 mins from London Gatwick and 50 miles from Heathrow Airports making the Lodge ideal for both Central London and numerous Local English Heritage and National Trust Tourist Attractions. The location is commuter used by those working in London making the Lodge easily accessible to both Central London and the London orbital M25 motorway with fast access to almost all attractions, (just five minutes to nearest junction). Trains to central London (Charing Cross Trafalgar Square, Victoria, London Bridge, Waterloo, Blackfriars) via Bromley South or Sevenoaks are easily reached within 15/20 minutes by car. Westerham (1 mile) boasts a large range of restaurants, bars, cafes, whilst Brasted offers numerous antique shops, historic half timbered houses. The immediate area is the home of Winston Churchill and Charles Darwin plus ruined remains of Medieval watchtower and Roman encampment are all nearby. GOLF: If you fancy a day of golf, then you can choose from over 15 golf courses all with 15 minutes of the Lodge. Westerham Golf Club is immediately alongside the Lodge and was born out of the great storm of 1987, which created an ideal site for a golf course and was opened in May 1997. The course consists of 18 holes set in mature woodland, with tree-lined fairways, water features and stunning views over the North Downs. The 6,272 yards, par 72 course has been built to a very high standard, with USGA specification greens and irrigation installed on the greens, tees and approaches. The course is complimented by a superb clubhouse, which holds first class facilities including a large spike bar, sun terrace, comfortable changing rooms, Pro shop and air-conditioned function suite. In addition the facilities include a 10-acre driving range, putting green, indoor teaching area and a brand new 8 acre short game area. NEAR BY SHOPS Westerham has everything one needs including Co-Op store but within a few minutes drive, many Superstores can be reached such as Sainsbury @ Bat and Ball Sevenoaks, Waitrose Biggin Hill, Morrisons Oxted, Tescos Riverhead Sevenoaks.